I was in a huge rush this morning and grabbed the first sweater on the top of the pile. It's Tailored Scallops by Pam Allen from Lace Style . The yarn is handspun, hand-dyed Cormo/Silk. 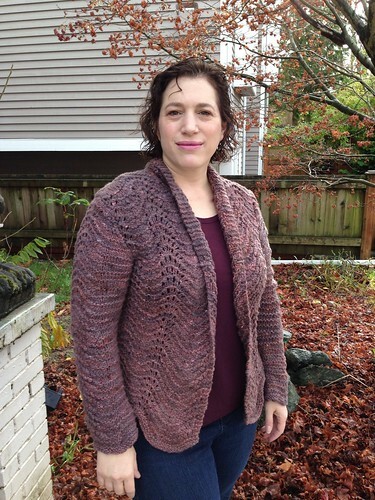 I finished this one in 2008 and don't wear it often because a) it's very warm and b) I've never been happy with the fit in the shoulders.